As humans beings, we are fortunate to have great eyesight which is the result of millions of years of evolution. Our vision enables us to spot danger, feed ourselves, and basically survive – which is why it’s so important to maintain our eyesight by leading a healthy lifestyle and attending regular eye examinations! Although our vision is spectacular, it pales in comparison to the abilities of many creatures on this planet. In fact, some of the tiniest species have truly amazing vision. Here are 5 animals with some of the best eyesight in the world. If you regularly visit rivers or canals, you have probably seen dragonflies whizzing past at some point in the past. While these small insects may look unremarkable, their unique vision allows them to see in the equivalent of ultra HD! Human eyesight has variations of three colours (red, blue, and green), but a dragonfly can see a much wider spectrum including ultraviolet light. The reason for this are light sensitive proteins known as opsins. 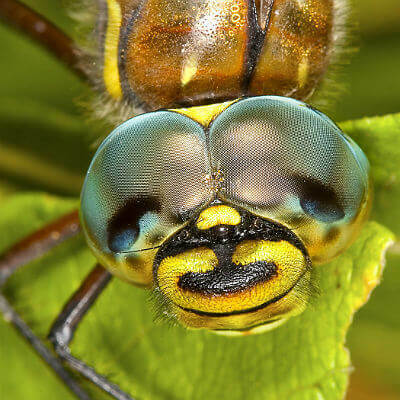 A dragonfly has between 15 and 33 opsin genes, giving them superb colour definition that helps them locate their prey, and ensures their place as the eyesight king of the insect world. 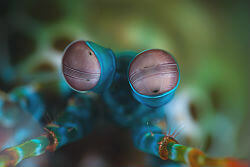 When it comes to phenomenal colour vision, the eyesight of the Mantis Shrimp takes some beating. Their technicolour world is generated by 12 colour photo receptors – 4 times more than a human being possesses! This allows them to see in both ultraviolet and infrared, which makes them one of the best hunters on earth. However, we should not be too downhearted with our own visual abilities. Shrimps need a higher degree of separation to decipher changes in colour, whereas we can easily see colours that blend into each other. Imagine being able see an insect on the street below from the top of a 10 story building – welcome to the world of eagle eyesight! 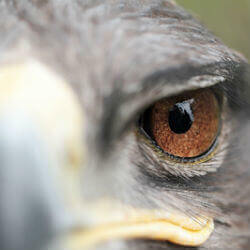 While all birds of prey have excellent vision (owls have superb night eyesight), eagles eyes are especially keen. They have around 4 times better distance vision than us mere mortals, giving them eyesight of 20/5 as opposed to 20/20 for humans. Like all birds, they have a third eyelid known as a nictitating membrane which helps to keep their eyes clean and in tip-top shape. A truly unique creature, snakes use heat to detect their prey! They have holes on their faces called pit organs, which send messages to their brain, allowing them to build up a thermal infrared image of their target. Interestingly, their eyes are not involved in this process – snakes have an extra sense that most other species do not possess, which means they can ‘see’ their prey up to 1 metre away, without needing to use their vision. Cats see clearly with only a sixth of the light we need, which means that their night vision is exceedingly good. Wild cats are nocturnal, and many domestic cats retain this trait, often going hunting in the early hours of the morning. Obviously, their eyesight has developed to give them the best chance of a successful hunting trip! Surprisingly, their close up vision is rather poor (20/100), and objects appear blurred. This may explain why they also sniff people who they greet. While these 5 animals have some astounding visual capabilities, if you currently wear glasses or contact lenses, it may be possible to improve your eyesight further. Both Laser Vision Correction and Implantable Contact Lenses can achieve 20/20 vision.